Provide easy "Laboratories Pack" and "IP Lock Writer + blank chip"
What is AES Cryptosystem ? AES(Advanced Encryption Standard) is common key cryptosystem chosen by NIST, US. Both encryption and decryption are high speed. And it is also stronger than triple DES. So it is noticed as encryption standard for next generation replaced with DES. Currently AES is adopted with security for financial system, LAN system and so on. Laboratories Pack contains encryption chips which are already written unique ID at shipment by Design Gateway. No one can rewrite this fixed ID key. To avoid duplication, each Laboratories pack have different unique ID key, so user must use IP Lock core with encryption chips in same package. Design Gateway provide encryption chip 10 pcs package (IPL-010L) and 30 pcs package (IPL-030L). This product is suitable for prototype and small lot usage. Writer pack is suitable for mass production. User can write any ID key to blank encryption chip by using IP Lock write. User can set and write optional ID key for each products or lot. Writer pack contains blank chip 3 pcs. For mass production, The Writer pack is used with Blank Chip (IPL-CHP, MOQ=100 pcs). Easy to protect your Logic data! just add simple circuit on the board!! Step5: Complete IP core protection! DC0/DD0 pin must connect to HR I/O bank. I/O voltage must be 2.5V or 3.3V. 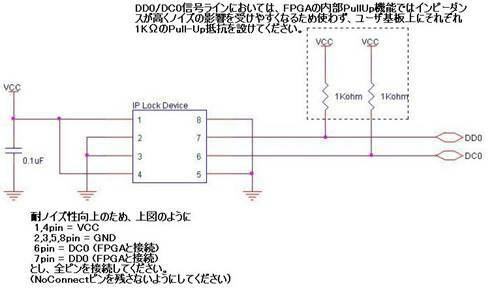 In case that HR I/O bank cannot be set I/O voltage more than 2.5V or DC0/DD0 pin connect to HP I/O bank, Voltage translator is necessary between IPLock and DC0/DD0 signal of FPGA. Please see "Readme.txt" in the zip file.